If pills and vitamins are part of your everyday routine, you’re probably all too familiar with the uninspired options for organizing your daily dosages. Assaf Wand decided to seize the design opportunity after watching his wife, Liron, struggle to find an attractive case for her prenatal vitamins and hearing his mother lament the lack of functional prescription cases. He recruited renowned industrial designer Yves Behar and his Fuseproject team to reinvent the mundane pill organizer and create smart, functional, ergonomic, and eye-catching alternatives. The result is the Thrive collection of pill boxes and pill organizers from Sabi, the health and wellness company Assaf founded. Each creation is something you want to show off, not hide in a pocket or drawer. And each is geared to make a more elegant experience out of storing, sorting, and taking medications and vitamins. Sabi’s modern accessories give each daily dose the thoughtful attention it deserves. 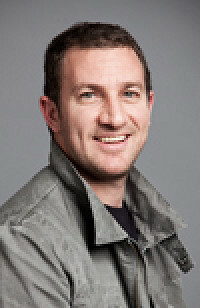 I’m Assaf Wand, founder of Sabi. We’re a new health and wellness brand, inspired by an ideal: that life’s regular, day-to-day tasks deserve to be elevated, savored, enjoyed. I’m proud to introduce our first line of products, Vitality, a series of uniquely designed pill organizers and accessories that bring newfound functionality, style, and fun to the mundane daily chore of pill- and supplement-taking. If you take vitamins or pills, then Sabi is for you. Let us transform this everyday imposition into a delightful routine. We promise, with Sabi’s Vitality products, you’ll actually look forward to taking your pills and vitamins! Looking forward to your comments. Please let me know if you have questions. Any plans for a reseller program? We'd love to sell your products. @generate design: Absolutely! We are setting up a program as we speak. Meantime, we are handling each potential re-seller on a case-by-case basis. Please email your details to: [email protected] Thanks for your interest! I have the wallet and holster....love them! 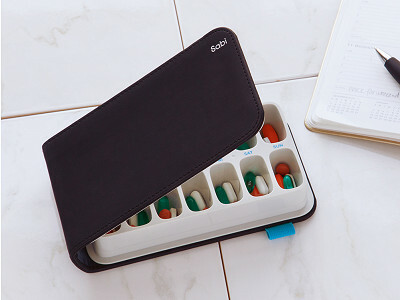 Finally a smart design to carry vitamins and meds that doesn't pop open in my luggage or take up a ton of room in my purse! @Chris D: Thanks for the great feedback! 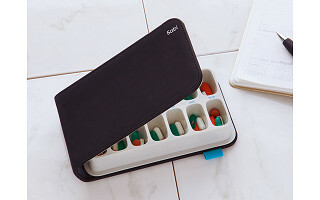 These are exactly the purposes we aimed to fulfill with the Vitality line - to redesign pill organizers and accessories to be high-functioning, sleek, easy-to-use, and easy-to-access. Thanks again. Whar about something for those who need 3x a day pills? @Sheri: Thanks for your query. If you take pills three times a day, holster is the product for you! It contains 3 separate pill compartments, and is meant for 3x daily usage. Product line and options look great! Designs are definitely overdue, especially for student athletes who take vitamin supplements but don't want to use medical looking storage containers like my son. Only concern is the opening of water bottle. What type of brush is used to clean inside of bottle? @Marivic: Thanks for your query. Indeed student athletes were one of the key users we were looking into when we designed the products. I personally am using my baby's bottle brush to clean it up and found it works great. Really like the looks of the Folio, but what keeps the pills in place when you open the lid? Wouldn't want my Mom's pills get mixed up. Thanks for your query. The folio is our light user weekly planner. There is a plastic cap that covers the entire tray but not individual cases. It doesn't spoil at all when carried in a purse, a bag or during travel. searches. I am an RN and this is a Federal Regulation. If you pour pills to go on a vacation, you still need to carry the original bottles in case you are searched. @Linda: Thank you for the heads-up; very important to keep in mind. You can ask your pharmacist to print up an extra bottle label for each of your medications that is going into the travel container. Make a pile of the labels, staple them together, then place into the tray somehow. Depending on the tray you buy, most have enough room somehow that you can lay the labels in the case before shutting the lid. Most pharmacy labels nowdays have in addition to the usual information a description of the pill or product itself (for example, my omeprazole says right on the label "lavender iron gray oblong capsules." If you have a label copy from the pharmacist for every product in the travel container, that will usually satisfy most law enforcement or TSA concerns. Remember, a prescription label is a pharmacist's legal representation of a physician's medication order. If the law enforcement or TSA representative has further questions, with the pharmacy label they can easily call your pharmacist for any needed clarifications. Remember too to make sure the pharmacist copies the label from the very last time you got the prescription filled, and with each new trip get a new set of labels. Don't try to use an expired label for this, it will backfire on you. I hope this information is helpful. Use it at your own risk, I am not an expert on drug laws in all states. Consult your local law enforcement or the law enforcement for you destination if you have further concerns. @Leanne Arons: What a great idea. Thank you for taking time to share. happy marriage of form and function! love these - great work Assaf! How many pills will each well of the folio hold? @ MM: The Folio has 14 pill "wells" (compartments). Dimension of each well is W: 20 mm x L: 36 mm x D: 14 mm/W: 0.8 in x L: 1.4 in x D: 0.6 in. Depending on the size of your pills, you can keep more than 1 pill in each well. Some customers were able to keep 4 -5 pills in a well. You can read more info in the DETAILS tab (under video) of the page where Sabi is featured. Beautiful collection. I am looking for a single day dispenser that allows me to organize the pills and capsules by 1) meals, 2) AM and 3) PM. Are you working on this one, too? Great idea. I think you should mention in your advertising that these can be used for your Pet's pills. I do dog rescue and have 4 senior citizen dogs with multiple bottles of pills to take some having to be crushed. Your containers would be ideal for me and my dogs. If pills and vitamins are part of your everyday routine, you’re probably all too familiar with the uninspired options for organizing your daily dosages. Assaf Wand decided to seize the design opportunity after watching his wife, Liron, struggle to find an attractive case for her prenatal vitamins and hearing his mother lament the lack of functional prescription cases. He recruited renowned industrial designer Yves Behar and his Fuseproject team to reinvent the mundane pill organizer and create smart, functional, ergonomic, and eye-catching alternatives.